This piece originally appeared on Fix.com. So you've been asked to attend a football game with a few friends. Of course you accept, and as you look into it a little more, you realize the parking lot allows tailgating prior to the game. What now? How will you pull off the perfect pre-game party for you and your friends? Don’t fret. It’s easy to throw an amazing parking lot party right at the tailgate of your car or truck. With these easy steps and tips, you’ll have an easy tailgate menu and a good game plan for all the action in the parking lot before the real game starts. The key to making a tailgate party low-stress is picking a menu that is easy to pull off in a parking lot. That means doing most of the prep work at home. Hot dogs are the easiest thing to make for a tailgate, but who wants to have a boring old hotdog on a bun when you’re supposed to be at a fun cookout? It’s easy to take a boring hotdog and turn it into something special by stuffing it with cheddar cheese and wrapping it in bacon. If you have 10 people coming, buy 20 all-beef jumbo hotdogs. The day before, slice each hotdog down the center (about halfway through) and insert a cheddar cheese stick. Then take one slice of bacon and wrap it around the hotdog. This will keep the cheese inside nice and tight. Use a toothpick to hold the bacon in place if it falls off. Prepare each hotdog and store them in the refrigerator in a covered disposable aluminum tin until you’re ready to leave for the game. Mac and cheese is easy to make the day before, and this version is even easier than the average version. No baking is required because this is a stovetop version. Cook the elbow macaroni in a pot on the stove per the instructions. Using another pot, follow these steps: add oil and butter to the pot and cook over medium heat. Whisk in flour and keep stirring for about 3 minutes. You want the mixture to turn light brown, but you don’t want to burn it. Slowly drizzle in milk and keep whisking. It will initially clump. You should have a nice smooth mixture with no clumps after all the milk is added. Add handfuls of the cheddar cheese and keep stirring. 6. Add the salt, pepper, dry mustard, and chili powder to the cheese mixture and mix in well. Add the cooked elbow macaroni to the cheese mixture and stir well. Place the macaroni and cheese in a buttered aluminum tin and cover. Store the tin in the fridge until you leave for the game. Preparing the meal is only half the battle when it comes to tailgating. 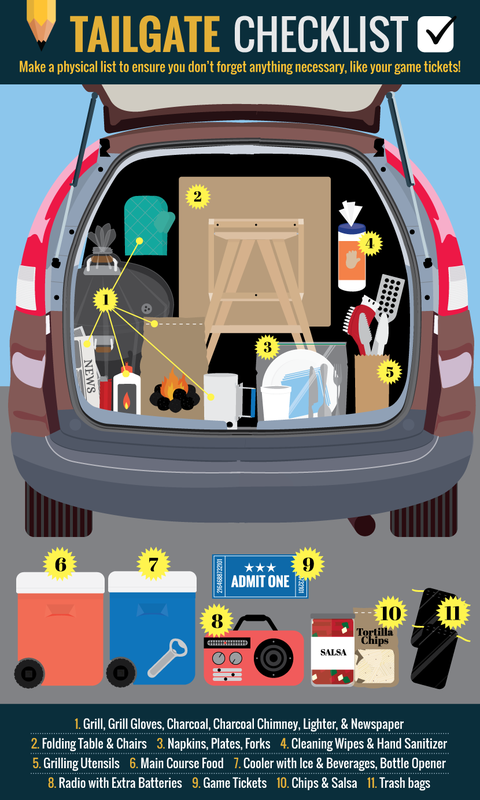 You need to recreate all the comforts of home in a parking lot, and you need to have everything you need tightly packed into your car or truck. First, make a checklist of essential items. You need a lighter, newspaper, charcoal, and a charcoal chimney to get your grill going. For serving, you’ll need plates, napkins, forks, and some condiments for the hotdogs. People also like to sit down, so pack some chairs and bring some games to play and a radio to listen to. A cooler is an obvious thing to take, but stock it with water for people who don't want beer or soda. Trash bags are critical because you’ll accumulate a lot of garbage, and no one wants to walk too far to throw it out. When transporting a grill, set it on a trash bag and cover it with trash bags. The ash may tend to spill a little bit as you drive. 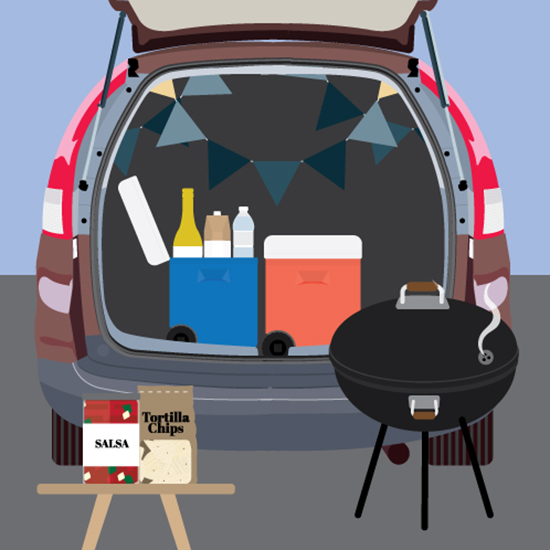 When you pack the grill, be mindful of how it is positioned in the car. When you pull into the parking lot you will have some options, especially if you get there early enough. Think about where you want to be. Do you think it might rain? If so, look for cover from a tree or a bridge. Where is the Port-a-Potty? You don’t want to be right next to it due to odors and long lines – being about 100 feet away from it is best. The worst thing is walking half a mile to find a bathroom. Look at who you are pulling in next to. Are they blasting music you can't stand? If you don’t like cigarette smoke, watch for people smoking and don’t park next to them. Try to be at least three cars away from someone who is being noisy and smoking. 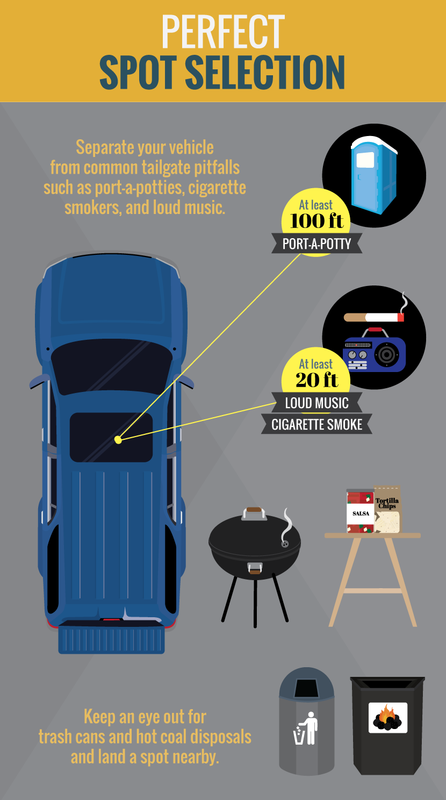 It’s easy to have your tailgate party ruined by a neighbor’s bad music and cigarette or cigar smoke. Last, look for a public trash can and a hot coal disposal drum. Parking lots usually have red painted charcoal disposal drums you can use to get rid of hot coals. Look for one and park close! After you pull into the spot, arrange the chairs and table around the cooler and set up the grill and table. The first thing you should do when you arrive at the tailgate is light the grill. Ball up some newspaper, put it underneath a full charcoal chimney, and use a lighter to light the paper. After about 10 minutes the coals can be dumped on one side of the grill. This is the direct cooking area. 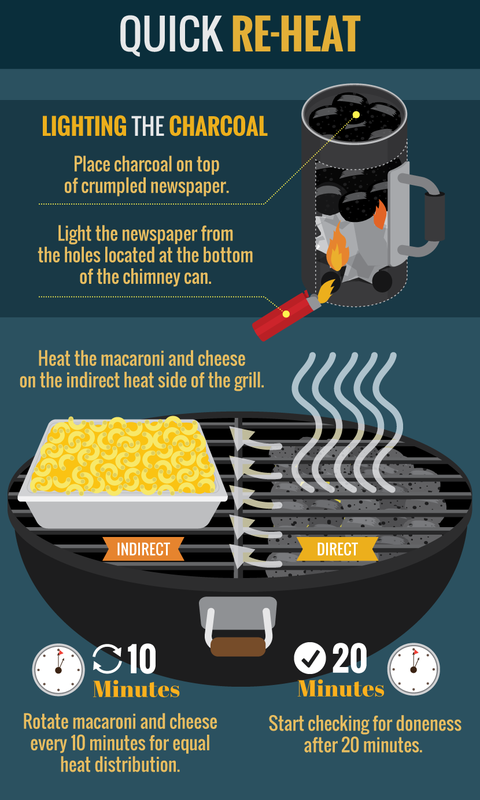 Place the macaroni and cheese on the indirect heat side of the grill and close the grill dome. After about 10 minutes, rotate the macaroni and cheese so the side that was close to the heat is now away from the heat. After another 10 minutes, start testing the macaroni and cheese to see if it is hot. Once it’s hot, remove it from the grill, cover it, and set it on a table. Place the bacon-wrapped hotdogs on the indirect side of the grill. Bacon will drip grease, so don’t attempt to cook the hotdogs over direct heat or the bacon will flare up. Close the dome and let the hotdogs and bacon cook for about 5–10 minutes. The cheese will slowly start to melt. Once the bacon looks cooked, quickly place the hotdogs directly over the heat for no more than 20–30 seconds each. This will get the bacon slightly charred and a bit crispy. Toast the hotdog rolls. Serve your guests plates with a hotdog on a toasted roll and a pile of macaroni and cheese on the side. As soon as the food is off the grill, close all the vents and let the fire go out. This should take about 25 minutes. Use oven mitts or heavy-duty grill gloves to roll the grill or charcoal container over to the hot charcoal drum and dump out the coals. It is important to do this as soon as possible so the grill has adequate time to cool before you load it into your truck or car. I like to do this about an hour before the game starts. This gives you about 25 minutes to cool the grill, a few more minutes to pack everything up, and enough time to find your seats.